Four years of experience with Daimler Fleetlines had left London Transport looking for an alternative double-decker - and it was NOT the Leyland Atlantean. That did not leave very much by way of British possibilities. LT had bought a small batch of Metro-Scania single deckers in 1973. MCW had linked up with Scania to produce an integral bus that might fill the double-decker role - the Metropolitan - and in August 1974 London Transport loaned their demonstrator, NVP 533M. This led to an order for 164 buses, the MD class, for delivery from December 1975 through to February 1977. The new buses were of all-steel integral construction, with Scania-Vabis BR111D running units beneath an MCW body. The wheelbase was long, at 16ft 10in (compared with 16ft 3in for the DMS), with a body 31ft 10in long, 8ft 2 1/2 in wide and 14ft 5 1/2 in high. It was a big bus, by contemporary standards, with a mass to match (10058kg). The top half of the body was a development of the DMS look, except for the air-conditioning unit on the top rear. But downstairs the front was very similar to the MS single-deckers, with a split level windscreen. Windows went right to the back. There was no front grille, just a recess with the rectangular headlamps and white-on-black numberplate. Radiators were mounted on the bus side walls, in front of the rear wheels. A heavy aluminium moulding ran round the bus below the lower deck-windows, with a kink behind the drivers window rather than at the front corner. Livery was red with white upper window surrounds and white bullseyes. The buses went to Peckham and New Cross garages for the 36, 36A and 36B, followed by the 53 and 63. They were crew-operated. Passenger reaction was initially good. They were QUIET, and the standard of the passenger accommodation was good. But the two garages could not make them run reliably, which soured things somewhat. Corrosion of the steel bodywork soon proved to be a problem, and several of the class underwent various treatments at Aldenham. Spares, the biggest problem faced by the transport industry world-wide at that time, was another headache. Three buses were stripped of main spares and dumped in Kingston yard in June 1979, never to run again. 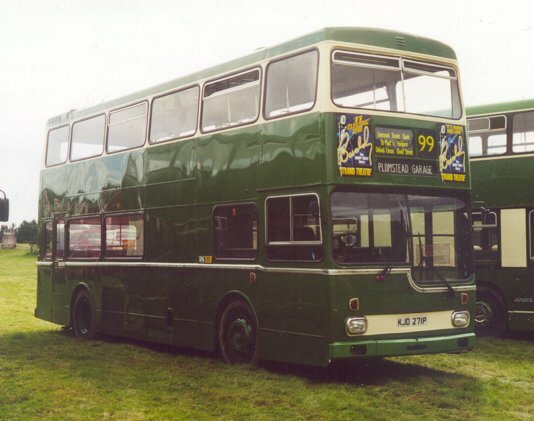 From January 1980 the 36 group was converted back to Routemasters, for trials of the BUSCO radio equipment, and displaced MDs moved to Plumstead (AM), where they were used (in crew mode) on the 122. At the same time some received repaints into plain red. Peckham converted some of the surplus MDs to omo operation, for use on the 78 from February 1980. 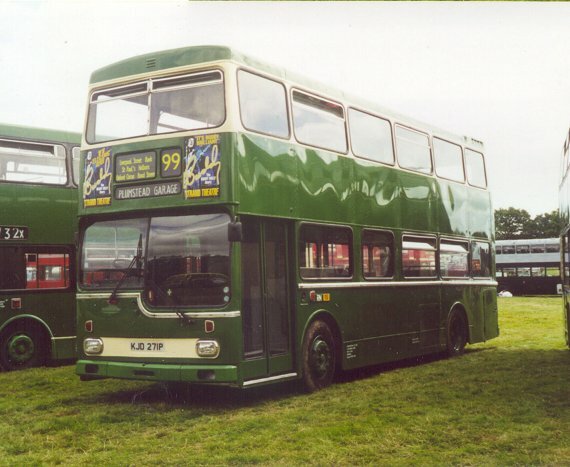 As more MDs were transferred to Plumstead they too were converted for omo operation, and were used on the 99 and 122A. August 1980 saw nine MDs condemned, including the three hulks at Kingston, and they were dispatched to Wombwell Diesels. The 192, a New Cross route, was transferred to Plumstead in September, with MDs. Early 1981 saw the remainder of the New Cross MDs replaced by Routemasters, and sent to Abbey Wood (AW) for the 180 (crew), then the 177, 178, 198 and 272 (all omo). At Plumstead and Abbey Wood the machines settled much better than they had at New Cross and Peckham. Reliability improved markedly, and at these garages they were well-liked. The two garages were amalgamated in October into the new Plumstead garage (PD). MD136 was named Selkent Ambassador for the opening. To give the new garage an all-MD allocation Peckham lost its MDs from the 78, and Plumstead's 161 was converted to MD. Catford's route 180 was also given to Plumstead at the same time, and Plumstead's own 151 and 192 were amalgamated into new (omo) 291. Despite their new-found popularity and reliability, the MDs were now non-standard buses in a fleet with lots of newer Titans and Metrobuses, and still plentiful older Fleetlines. After the Fairs Fare policy had been ruled illegal bus ridership in London plummeted as fares had to be raised substantially. London Transport had too many buses. Routemasters and MDs were on the chopping block. Plumstead started to receive Titans to replace Metropolitans in September 1982, and by April 1983 all had been replaced. Two (MD77 and MD127) were reinstated briefly, but bowed out by June. Even then MD127 had a last fling, although not in service. It was used as a test-bed for a startling white and red livery for the 177 Express service, and appeared so painted at the August 1983 Aldenham Open Day. It was its last appearance for London. The MDs had been and gone: in and out in seven years. 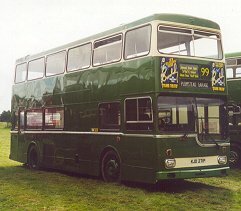 During 1982 and 1983 many were sold to other bus companies, including 21 to Reading Corporation Transport (which were repainted at Aldenham before despatch). Independents took them too, including Alec Head (Lutton) and Whippet Coaches (Fenstanton), where they had many years of service before the corrosion finally caught up with them. Even then one survived into 2001 in service. 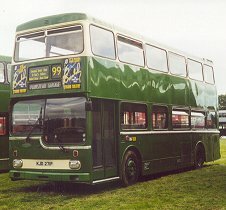 Imperial Buses of Rainham bought MD71 and painted it in its smart green and cream livery, for use initially on contracts and rail work, but latterly on new route 100 on the Essex fringes. By March 2002 however it had passed away to the Yorkshire scrapyards. 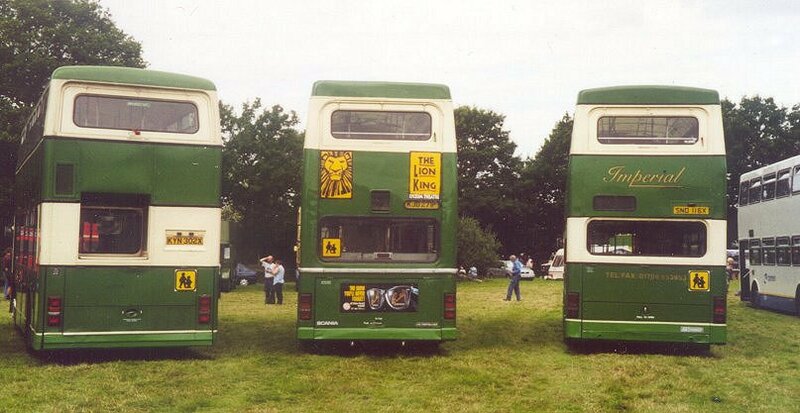 Imperial Bus MD71 at Lingfield, sandwiched between an ex-Manchester Metrobus and a Titan. MD1 went to a Scania museum in Sweden, and MD80 is in preservation in he UK. Thirty years after withdrawal from LT, MD60 reappeared in 2014 onto the public scene, restored by Ensignbus for a preservationist. It nows appears regularly at events. An excellent gallery of MD photos, in London and post-London service, by "Overground"
Bus Stop MD. photo references. bus histories. M.